Please consider a donation from among the optional levels shown in the left sidebar. Every donation will help us achieve the important promise of Section 2706 and put all licensed health care providers on equal footing in the health care finance marketplace. CoverMyCare is designed to bring the real-world experience and beneficial health outcomes shared by patients and their providers into critical insurance marketplace decisions taking place in your state in 2014. The best way to succeed in our goal is to engage the national integrative health community — patients, providers, and members of the public — in all the states. 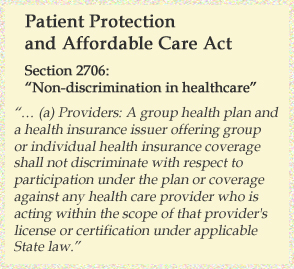 CoverMyCare will enable informed advocacy that supports greater access for everyone to all licensed healthcare providers, which is the core intention and promise of Section 2706. In order to fully launch CoverMyCare, $60,000 is needed. Please consider a level that is comfortable for you personally, or for your practice if you are a care provider. You may use PayPal or a credit card. An Information Toolkit that tells the integrative story: how and where practitioners get their training; where practitioners are partnering with conventional medicine: in military and veterans health, medical schools, in clinical care for chronic pain, cancer and diabetes treatments. A growing national community of professionals and patients with deep experience in integrative health practice.